I love mushrooms, but hubby has an aversion to them, so I rarely eat them at home anymore. Last week, I found the most delicious looking oyster mushrooms at the supermarket and couldn’t resist picking them up. Oyster mushrooms are a great source of protein, vitamin B6, folate, iron, and dietary fiber and are delicious to boot. 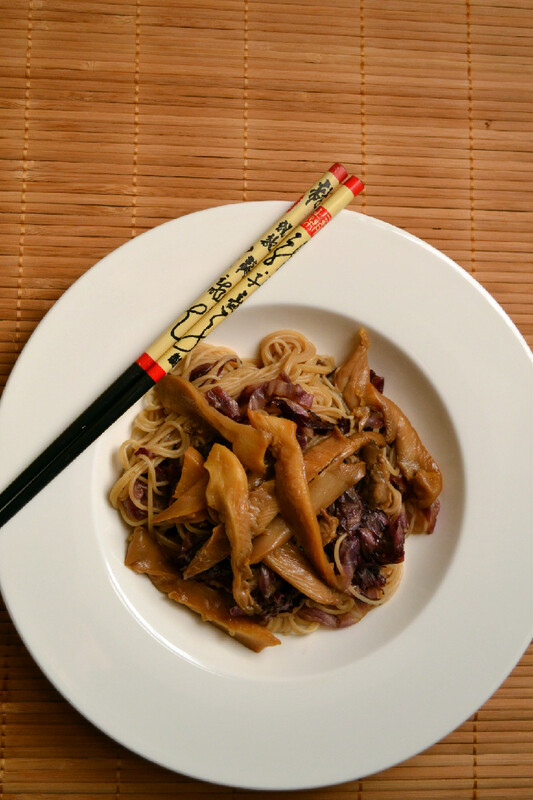 Here they’re sauteed in sesame oil, garlic and soy sauce and then tossed with shredded red cabbage and gluten-free brown rice and millet noodles for an incredibly simple, light, yet flavourful meal. I initially thought it was too simple to share on the blog, but as I enjoyed my lunch I relished in the simplicity of it. We all lead busy lives, and we all find ourselves in a bind sometimes, we don’t always feel like prepping and chopping 20 ingredients and we don’t always have the time to do it even if we wanted to. What we all need is more quick and easy, yet healthy and flavourful meal ideas to get us through those days and this 6 ingredient noodle bowl is just that. Cook noodles according to package directions (go for firm/al dente, you don’t want to overcook the noodles in this step). Drain and rinse in cold water to stop the cooking process. Set aside until ready to toss. Meanwhile, heat sesame oil in a wok over low medium heat. Add garlic and sautee for 2 minutes, being careful not to burn it. Add sliced mushrooms and soy sauce and stir fry for a few minutes until softened. 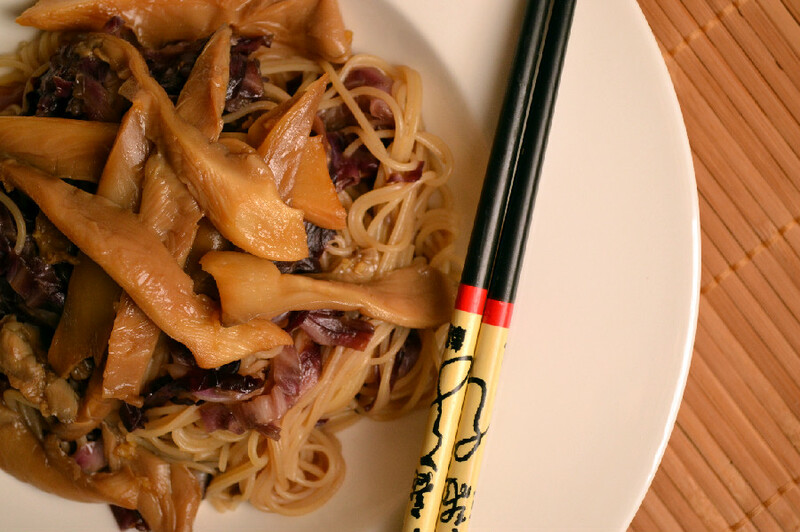 Transfer mushrooms to a plate and set aside, leaving their liquid in the wok. Add shredded red cabbage to the same wok and cook until slightly wilted. Toss noodles with the wilted radicchio until well combined and noodles are fully cooked and heated through, about 3 minutes. Transfer to a serving bowl and top with oyster mushrooms before serving.